Connect A Sketch Is An Etch A Sketch With Multiplayer | OhGizmo! By Andrew Liszewski on 04/28/11 • Leave a comment! The last time I used an Etch A Sketch I spent an entire lazy afternoon painstakingly scraping as much of the metallic powder off the ‘screen’ as I could. Needless to say the toy has lost some of the appeal it had for me when I was younger, but design student Andrew Little may have come up with a new way to make it interesting again. 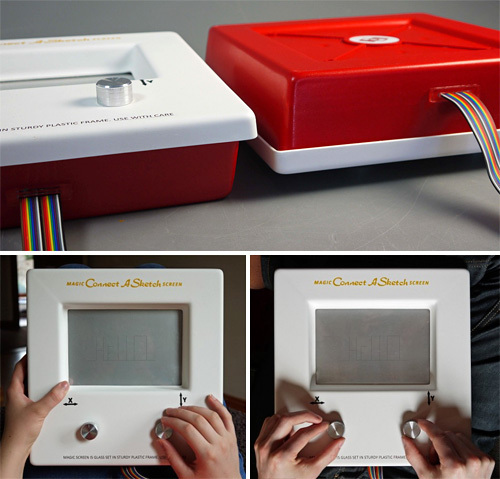 His Connect A Sketch concept features a couple of modified Etch A Sketches linked together allowing both users to collaborate on the same drawing. I’ve no idea how the internal mechanisms work, allowing two sets of arms to control a couple of points etching away at the screen at the same time, but I feel it would make the act of doodling incredibly aliased circles and curves a bit more interesting. At the moment the Connect A Sketch setup is tethered by a colorful ribbon cable between the two units, but in the future Andrew hopes to make each device wireless, connecting to each other over the internet via a central hub website where users can logon and find other frustrated artists.